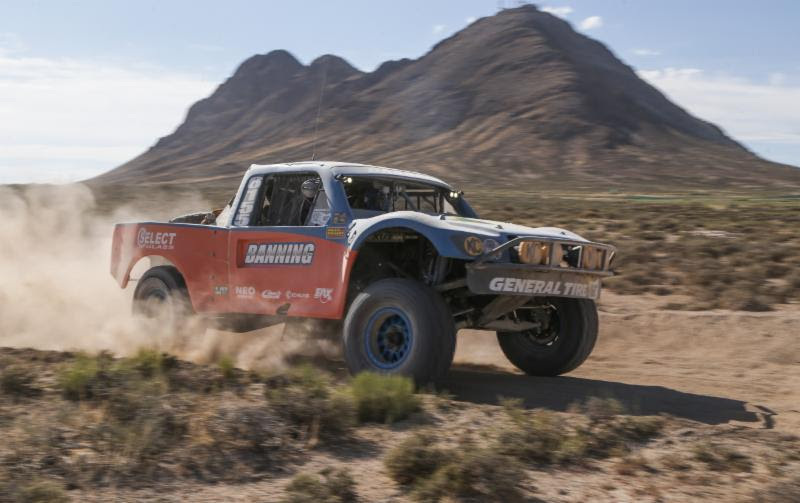 Banning Motorsports returned to the grueling BITD Vegas To Reno to take home another win! 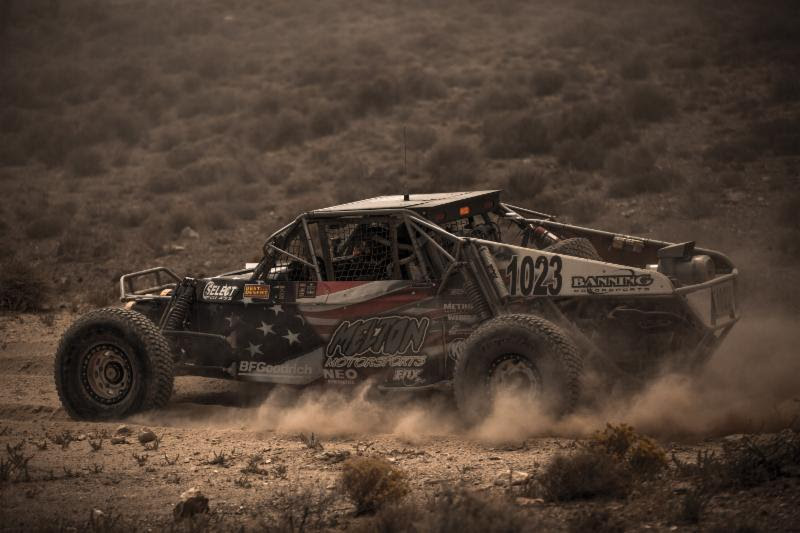 Phoenix, Arizona (September 10, 2015)– Banning Motorsports does it again as they return to the 2015 Best In The Desert “Vegas To Reno” and claim yet another win at this grueling race. The team is always ready for this race and with previous wins, they knew they had what it takes to put the throttle down and get to the finish line. The 550-mile course provided the drivers with many tasks and moments of frustration but they stayed mentally fresh for the terrain at hand. The race started as expected for the #2488 Banning Motorsports car that had Bryan Folks in control. 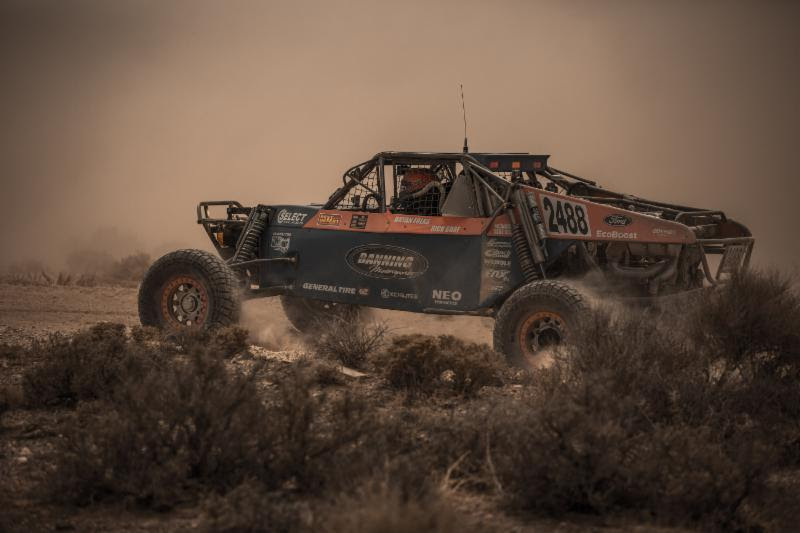 The dust, the traffic and the course had all been to be expected but the team did not plan early on in the race to be plagued with brake problems. Pulling over in pit 4, the team went to work on fixing the brakes as well as changing a damaged rear axle. Rick Graf took over driving responsibilities and had well over an hour to make up to get back in the lead. Graf put his head down and took the task as a challenge and drove his best. “Just as in all of racing, fortitude and tenacity paid off.” Stated Folks. Pulling into pit 13 they saw the lead car and decided to skip the major light bar so that they could get out in front of the leader. This paid off and the #2488 car was able to beat the odds of part failures and still managed to win in their class and grasped that points lead. Another Banning vehicle off the line was the #6155 truck. A stacked class and starting position of 13th, they knew that they would have their work cut out for them. A strong start set them up for opportunities to pass even in the thick of the heavy dust that competitors stirred up ahead of them. Making their way to the top 3 in their class by race mile 150. It wasn’t long after that they started having issues with the truck. Vapor locking had took over and had them on the side of the course not just once, but twice. “I hiked back nearly a half a mile to a camp we had passed and borrowed 5 gallons of gas just so we could poor it in the tank and try to cool off the rest of the fuel.” Stated Lee Banning Sr.
A minor flat tire set them back on time again but they didn’t let this stop them from pulling into pit 5 for the next drivers change where Gary Williams Jr. would take over driving duties. Gary and Co-Rider, Chris Godfrey, started out the next portion of the course aggressively. The vapor locking issues would creep up again and another flat tire put them back from the time they had made up. They didn’t let this stop them from passing competitors and getting the truck to the last drivers change of the race. A quick top off with fuel, a fresh driver, Lee Banning Jr., their KC HiLites bar to guide them through the night and just like that they were back out on the course making their way towards the finish. The night sky and the cooler air temperatures really helped the truck run better. Heavy traffic and dust did not stop them from making it across the finish. The #6155 truck finished 6th in class after fighting issues all day. The relief to have finally crossed the finish line was well worth celebrating. “A huge Thanks to the whole team for staying in the fight all day getting all the cars to the finish. A great statement for our team battling this very tough race. Thanks to all our sponsors, partners, and fans for standing with us and helping achieve so much success.” Stated Lee Banning Sr.
Another car under the Banning pit is the #1023 of Melton Motorsports. Leaving the line 23rd they knew it would be a long day. Hayden battled closely with Jason Coleman throughout the morning but after pulling into pit 2 Hayden would get passed by Coleman. He trailed Colemans dust till the next pit where he got back around him. The back and forth between the two race vehicles would go in well into the race. Flat tires and drivers change would always keep them neck and neck. Steve Melton jumped behind the wheel was continued the battle when he finally got right on Colemans bumper and went for a solid pass. After completing the pass they gassed it to the finish line with their KC Pod lights guiding the way. The rocky course and back and forth battle lead the team to a 2nd place finish. “The success of our Vegas to Reno finish is directly due in part to the prep by Chris, Andy, Rick along with the pit support by Banning Motorsports. 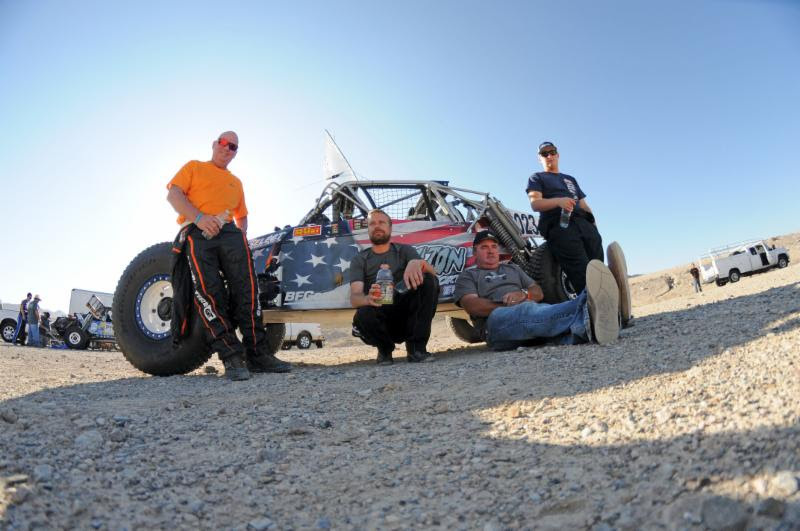 Thank you to all the crew and to our sponsors: Melton Off road, Banning Motorsports, Select Glass, KC Hilites, Wiks Racing Engines, Weddle Industries, Neo Oil, BFG Tires, Method Wheels, JTech, and Foddrill Motorsports.” Stated Steve Melton. Be sure to follow Banning Motorsports on Social Media for event day updates.